Nearly five million people in Canada – that’s one out of every seven individuals – currently live in poverty. Poverty is a widespread issue across the country and the world, but vulnerable groups such as people living with disabilities, single parents, elderly individuals, youth, and racialized communities are more susceptible. The effects of poverty can be expressed in different aspects of a person’s life, including food security, health, and housing. The following statistics show the different manifestations of poverty in Canada. If you have any questions or would like to request more information, please contact us or subscribe to our newsletter. The following are statistics about the current reality of poverty in Canada. In Edmonton, 1 in 8 individuals are currently living in poverty. Poverty costs Canada billions of dollar annually. Precarious employment has increased by nearly 50% over the past two decades. Between 1980 and 2005, the average earnings among the least wealthy Canadians fell by 20%. Some members of society are particularly susceptible to the effects of poverty. The following statistics suggest groups who are particularly likely to experience poverty. People living with disabilities (both mental and physical) are twice as likely to live below the poverty line. Estimates place the number of homeless individuals living with a disability or mental illness as high as 45% of the overall homeless population. 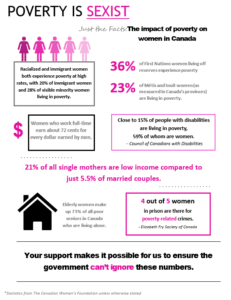 21% of single mothers in Canada raise their children while living in poverty (7% of single fathers raise their children in poverty). Indigenous Peoples (including First Nations, Métis, and Inuit peoples) are overrepresented among the homeless population in virtually all urban centres in Canada. 28%-34% of shelter users are Indigenous. 1 in 5 racialized families live in poverty in Canada, as opposed to 1 in 20 non-racialized families. Racialized women living in poverty were almost twice as likely to work in manufacturing jobs than other women living in poverty. Overall, racialized women earn 32% less at work. Nearly 15% of elderly single individuals live in poverty. Children and youth under 18 are particularly vulnerable to conditions of poverty. The following statistics outline risk factors and the realities of youth poverty in Canada. In Canada, 1.3 million children live in conditions of poverty (that’s 1 in 5). 1 in 5 Edmontonian children (under the age of 18) live in poverty, which increases to 1 in 3 children in single-parent families. 40% of Indigenous children in Canada live in poverty, and 60% of Indigenous children on reserves live in poverty. More than one-third of food bank users across Canada were children in 2016. About 1 in 7 of those using shelters in Canada are children. One aspect of poverty is not having enough food or having limited to access to nutritious and healthful food. The following statistics outline the reality of hunger in Canada. Residents in Nunavut spend twice as much on food as the rest of the country on average ($14,800 v. $7,300 annually). 4 million people in Canada experience food insecurity. 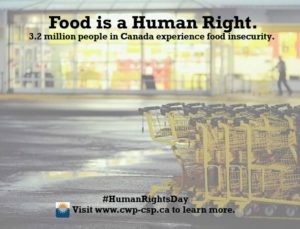 1 in 8 Canadian households struggle to put food on the table. In 2014, the majority of food insecure households – 62.2% – were reliant on wages or salary from employment. 8 out of 10 provinces saw an increase in food bank usage in 2016. 62% of children living in the North are food insecure. 2 out of every 5 Northern households are food insecure. Food bank usage across Canada is 3% higher than 2015 and 28% higher than it was in 2008. In Nunavut, 7 of 10 Inuit preschoolers live in food insecure households. Food bank usage has increased in all provinces since 2008, apart from Newfoundland and Labrador. 2% of food bank users are Indigenous. The effects of poverty are wide-ranging and can be difficult to see from the outside. The following statistics show the risks and effects poverty has on an individual’s physical and mental health. 1 in 10 Canadians cannot afford to fill their medical prescriptions. Canada is the only industrialized country with a universal healthcare system but without a national pharmacare policy. A McMaster University study found a 21-year difference in life expectancy between the poorest and wealthiest residents of Hamilton, Ontario. Researchers have found that men in the wealthiest 20% of neighbourhoods in Canada live on average more than four years longer than men in the poorest 20% of neighbourhoods. Estimates place the cost of socio-economic disparities in the health system to be 20% of all healthcare spending. It has been estimated that $1 invested in the early years of a child’s life can save up to $9 in future spending in the healthcare system. Food insecure households were 80% more likely to report having diabetes, 60% more likely to report high blood pressure, and 70% more likely to report food allergies. Homelessness is the most obvious expression of poverty’s effect on housing, but it’s not the only one. 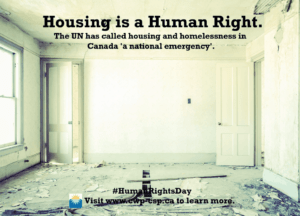 The following facts delve into housing instability and homelessness in Canada. An estimated 235,000 people in Canada experienced homelessness in 2016, with roughly 35,000 people being homeless on any given night. Three-quarters of Yukon’s population live in Whitehorse where the average price of housing increased 80% over six years. In Toronto, there were 5,219 people who were homeless in 2013 (the latest available data). Roughly half of the homeless population were on wait lists for affordable housing during the same period. Canada Mortgage and Housing Corporation predicts that its major national housing program funding will fall from $3.04 billion (2010) to $1.68 billion by 2017 — a $1.36 billion difference. According to new research, spending $10 on housing and support for high-need chronically homeless individuals resulted in almost $22 of savings related to health care, social supports, housing, and the justice system. Canada is a wealthy country, but people living in Canada still experience poverty. How does Canada compare to other countries around the world? UNICEF rated Canada 17thout of 29 wealthy countries due to the number of children living in poverty in Canada and 26th out of 35 wealthy countries for overall child inequality.